Voters remain wary of U.S. global involvement. A majority (54%) says that the U.S. should deal with its own problems and let other countries deal with their problems as best as they can; 41% say the U.S. should help other countries deal with their problems. This is largely unchanged since April, when 57% said the U.S. should prioritize dealing with its own problems. 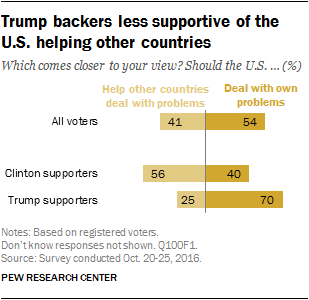 There are substantial differences between Clinton and Trump supporters in opinions about whether the U.S. should help other countries. A large majority of Trump supporters (70%) say that the U.S. should let other countries deal with their own problems, while just a quarter say the U.S. should help other countries. Clinton supporters are more divided, but a greater share (56%) says the U.S. should help other countries, while 40% say the U.S. should let other countries deal with their own problems as best as they can. As was the case in April, Democratic and Democratic-leaning registered voters are more likely than Republican voters to say the U.S. should help other countries deal with their problems. But since then, the balance of opinion among Democratic voters has moved modestly toward helping other nations. Today, 54% say the United States should help other nations deal with their problems, while 42% say it should deal with its own problems and let other countries deal with their problems. In April, opinion among Democratic voters was divided (47% help other nations, 49% deal with own problems). Views among Republican voters have remained virtually unchanged since then, with more than twice as many saying the U.S. should prioritize dealing with its own problems (66%) rather than help other countries with theirs (29%). Aside from the partisan gap on helping other nations, there also are educational differences. Voters with postgraduate degrees are the only educational category in which a majority (57%) says the United States should help other nations deal with their problems. An identical share of those with less education (57%) say the U.S. deal with its own problems and let other nations deal with their problems. Supporters of Donald Trump are largely critical of free trade agreements generally and of the proposed Trans-Pacific Partnership, or TPP. Clinton backers, by contrast, express generally positive views of both free trade in general and the TPP. Roughly seven-in-ten Trump supporters (72%) say free trade agreements have been a bad thing for the U.S., while only 21% say they’ve been a good thing. Trump supporters’ views of the TPP are similar: Two-thirds (66%) say it would be a bad thing for the U.S., compared with 17% who say it would benefit the country. By a two-to-one margin (58% to 29%), Clinton supporters say free trade has been a good thing for the country. Views of the proposed TPP agreement also continue to garner generally positive assessments from Clinton backers: 56% say it would be good for the U.S. and 24% say it would be a bad thing. About a quarter of Clinton backers (24%) do not express an opinion about how the TPP would impact the U.S.
Republicans’ views of free trade continue to grow more negative. 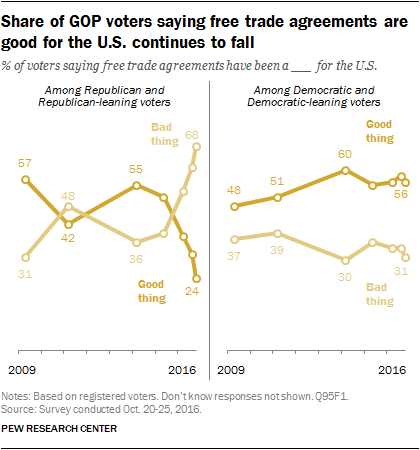 Currently, about two-thirds of Republican and Republican-leaning registered voters (68%) say free trade has been a bad thing for the U.S. Only about a quarter (24%) say it has been good for the country. The share saying free trade has been a bad thing has edged higher since August. Sentiment is much more negative than it was in May 2015 when 51% of Republican voters said free trade was a good thing for the U.S. and just 39% said it was a bad thing. Democrats, on the other hand, remain largely positive about free trade. A majority (56%) of Democratic and Democratic-leaning registered voters say free trade agreements have generally been a good thing for the U.S. These views are little changed since August and have been relatively stable over the course of the last few years. More than twice as many voters say the U.S. military campaign against Islamic militants in Iraq and Syria is going not too or not at all well (64%) as say it is going very or fairly well (31%). And this negative view of how the campaign is going is particularly pronounced among Trump supporters. Nearly eight-in-ten (79%) of those who plan to vote for Trump say that the military campaign against ISIS is not going well. Just 18% say that the campaign is going at least fairly well. By contrast, Clinton supporters are more divided, with nearly as many saying the military campaign against ISIS is going not too well or worse (49%) as say it’s going very or fairly well (45%). Voters remain divided when it comes to their bigger concern about the military campaign against ISIS. As many say their greater concern is that the U.S. will go too far in getting involved in the situation in Iraq and Syria, as say they are more concerned about the U.S. not going far enough (45% each). More Clinton supporters say their bigger concern is that the U.S. will go too far in getting involved (58%) than say they’re concerned the U.S. will not go far enough (31%). The balance of opinion is reversed among Trump supporters: Two-thirds (67%) say their greater concern is that the U.S. will not go far enough, while only a quarter (25%) say they are more worried about the U.S. going too far in getting involved. Overall, there is little change in views of how the U.S. military campaign against ISIS has been going since April of this year. However, Republican and Republican-leaning registered voters are now more likely to say the campaign is not going well. In April, a majority of Republicans (70%) said the campaign against ISIS was going not too (44%) or not at all well (24%). Today, that share has increased 10 points to 80%. Views of how the military campaign against ISIS is going among Democratic and Democratic-leaning registered voters have remained largely the same since April. More voters say the U.S. does not have a responsibility to accept refugees from Syria into the country (54%) than say the U.S. does have such a responsibility (41%). While Clinton and Trump supporters differ on many issues, the divide over accepting Syrian refugees is particularly striking. Trump supporters overwhelmingly say that the U.S. has no responsibility to accept refugees from Syria: 87% say this, while just 8% say they the U.S. does have a responsibility. By contrast, just 27% of Clinton supporters agree that the U.S. does not have a responsibility to take in refugees from Syria. More than twice as many Clinton backers (69%) say the U.S. does have a responsibility to accept these refugees. Young voters are more likely than older voters to say the U.S. does have a responsibility to accept refugees from Syria into the country. Nearly half of voters under the age of 30 (49%) and ages 30 to 49 (47%) each say the U.S. does have such a responsibility, compared with just 34% of those ages 65 and older. Opinions also are divided along education lines. Voters with postgraduate degrees (62%) are the most likely to say the U.S. has a responsibility to take in Syrian refugees, while just 30% of those with no more than a high school diploma agree. As in the past, roughly half of voters view both Russia and China as serious problems but not adversaries (48% Russia, 51% China). A quarter says Russia is an adversary, while 19% says the same of China. And comparable shares regard each country as “not much of a problem” (21% Russia, 25% China). Similar shares of Clinton and Trump supporters view Russia as an adversary (29% of Clinton supporters, 24% of Trump supporters), but Clinton backers are 13 percentage points more likely to say Russia is a serious problem (53% vs. 40%). And while 30% of Trump supporters say Russia is not much of a problem, only 13% of Clinton backers say the same. By contrast, Clinton supporters are more likely than Trump backers to think of China as not much of a problem (31% vs. 19%). Since April, views of Russia among Republican voters have shown very little change. But the share of Democratic voters saying Russia is an adversary has increased from 21% to 28%. And the share of Democrats saying they don’t see Russia as a problem has fallen from 27% to 15%.